Phi Phi weather in October starts with the wind from the west, humidity in the air but a lovely temperature of 32 degrees centigrade. The air temperature can drop during a shower but quickly returns to normal once finished. The sea stays 29 degrees it does all year but will be cooled at the surface due to the rain. Phi Phi weather in October is often cloudy part of the day and in the early days of the month for a couple of days at a time. The cloudiness reduces as the months go on to the point where you can get a couple of perfect high season days a week. 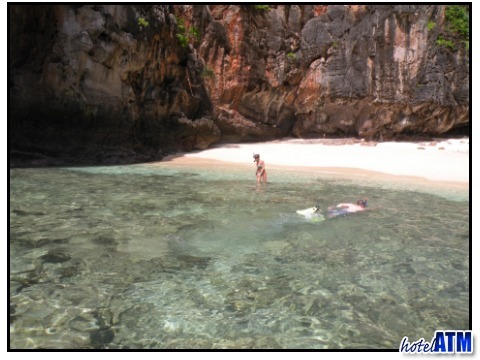 Tours are affected by the Phi Phi weather in October as a strong wind will whip up waves. This means that access to Maya Bay by sea is regularly unsafe. This leaves the walk through from Loh Samah as the only way into Maya which is quite the adventure. Phi Phi tours will still go ahead every day as the tall cliffs leave the water flat calm on the eastern side of the islands. The endless variations of diving, snorkeling, kayaking, cliff jumping and more will see out weeks of fun. Ferries sail every day and during any Phi Phi weather in October however, when it does blow up, the smoother crossings are Phuket to Phi Phi and Phi Phi to Krabi, i.e. going from west to east. This means you are going with the waves. The large 08.30 ferries from Phuket to Phi Phi are the best ferries when the waves are up. The journey from Phi Phi to Phuket are quite a lot better in the larger vessels such as Sea Angel. Most of the sea journey from Phi Phi to Krabi is in the 'lee' of the Phi Phi Islands and there not as many large waves. The advantage of staying during the Phi Phi weather in October is that 'Low Season' room rates are almost 40% less expensive than 'High or Peak Season' rates. This means you can get the luxury Holiday Inn Phi Phi Island and Phi Phi Island Village Resort And Spa at a considerable saving. If you are then staying for a few days these hotels offer free nights or discounts on top sometimes, making a further 20% reduction. For more information on value for mid-range or budget accommodation see ">Phi Phi Cheap Accommodation, Cheapest Phi Phi Guesthouses, and Phi Phi Hotel review. These articles point out where, when and how to get the best value for your kind of holiday. To compare the Phi Phi weather in October see articles on the main Phi Phi weather page where you can see an article for September and November and every other month. There are also articles on Koh Phi Phi weather forecast, Phi Phi Island Green Season, Phi Phi Island Busy Season, and more. The Phi Phi Rain radar measured from the Phuket International Airport gives a great idea of what's happening in the low season months.